San Francisco, CA, October 23, 2013—With all the hours they spend playing video games, it's only natural that some kids want to learn to make their own. But where do they begin? Parents in the know get their kids started with Scratch, a wildly popular (and free) educational programming language. Scratch lets kids build interactive games, stories, music, and art by dragging together colorful blocks of code, without having to worry about spelling errors or syntax—perfect for curious young learners. Super Scratch Programming Adventure! (No Starch Press, October 2013, 4C, 160 pp., $24.95, ISBN 9781593275310) is a new edition of this best-selling introduction to programming, endorsed by Scratch's creator Mitchel Resnick. Now updated to cover web-based Scratch 2, this full-color, cartoon-illustrated book teaches kids to code by showing them how to make arcade-inspired video games that are fun to play and even more fun to program. The result is a painless and entertaining introduction to programming concepts like variables, flow control, and subroutines. "There's tremendous interest worldwide in teaching kids to code," says No Starch Press founder Bill Pollock. "But there's a surprising shortage of good, introductory resources designed for kids. Most schools aren't meeting the need and many parents don't know where to turn, which is why we're creating a line of STEM books for kids, headed by best sellers like Super Scratch Programming Adventure! and Python for Kids. Science and technology are great fun, and we aim to prove it." The new edition of Super Scratch Programming Adventure! arrives in bookstores everywhere in late October 2013. For more information or to request a review copy of Super Scratch Programming Adventure!, contact KC Crowell at No Starch Press ([email protected], +1.415.863.9900 x100 or visit www.nostarch.com). Praise for Super Scratch Programming Adventure! "Reveals the power of this deceptively simple programming language. A fun way to learn how to program Scratch, even for adults." "An introduction to game design. Kids will start building games from the first page." "If you think you might have a future programmer on your hands, it's time to introduce your kid to Scratch. Super Scratch Programming Adventure! makes it even easier to get started." An enjoyable and highly accessible introduction to this technology and the power of computing." "If you're looking for a way to get your kid interested in programming, and Scratch in particular, I can't recommend this Scratch book enough." 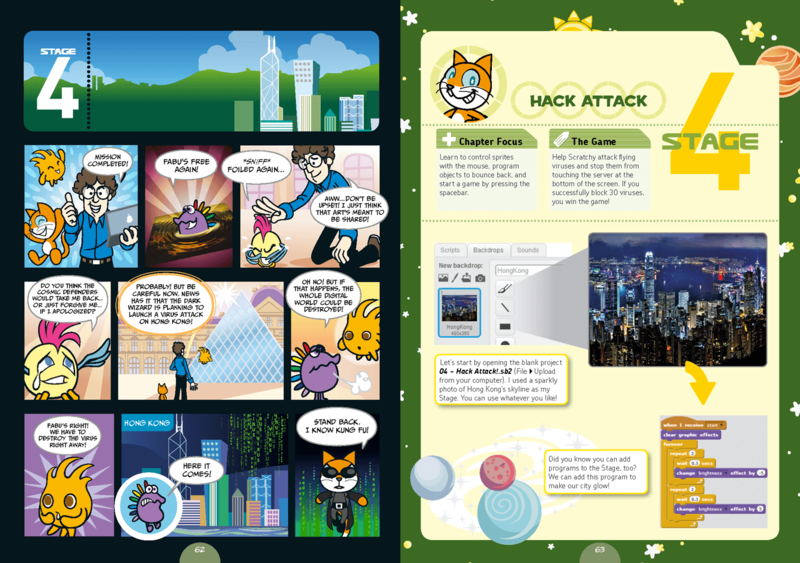 The Scratch programming language makes it easy to create interactive art, stories, simulations, and games, and share those creations online. Scratch is developed by the Lifelong Kindergarten Group at the MIT Media Lab. The Scratch website has more than 2 million registered users who have shared nearly 4 million projects to date. October 2013, 4C, 160 pp. A Playful Introduction to Programming!